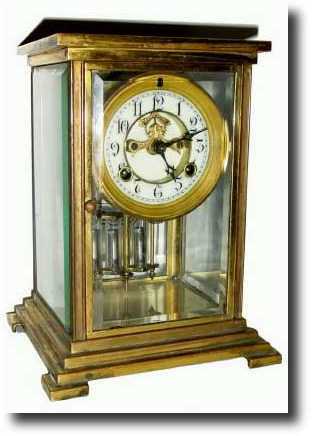 C.1906, Waterbury Clock Co., "Navarre" crystal regulator shelf clock in good but unrestored condition. The case could use a polishing as it has signs of tarnish. The porcelain dial is very good (minor chip by rt winding hole) and the beveled glass is perfect. The movement is a round plate "French type" with rack strike and exposed escapement. The pendulum is extra nice with original gilding and vials. The clock has label under the base. Cleaned up and polished this would be a very beautiful clock. Height 8"